This post is a gift to those of you sweltering in hot climates. It’s coming. 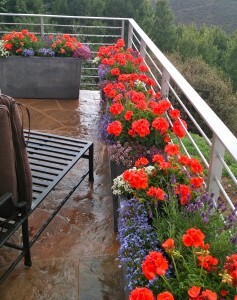 As I stepped out on the front terrace to water pots three days ago, the first swirly wind brushed my face. Chipmunks, maniacal creatures that they are, were especially spastic all weekend. Sunsets have been coral and lilac, infusing evenings with a peachy glow. Vendors roast hatch chilies at farmers’ markets, creating hunger-inducing aromas that beg for a slow-cooker stew. For fifteen years, when starting to shut down the ranch house before heading home so the kids could start school, I watched for dropping evening lows that hinted at the approach of fall. The ten-day forecast now is nice and steady: highs in the seventies and lows in the forties. onto the deck that adjoins my office. 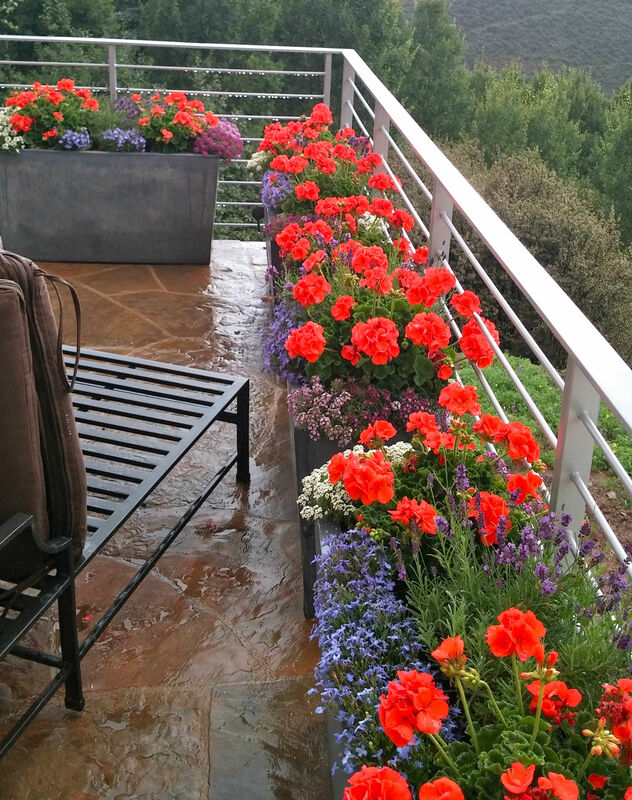 It looks like summer—heavily blooming geraniums, lobelia, lavender, alyssum. So I strolled the big berm of horticultural treasures. 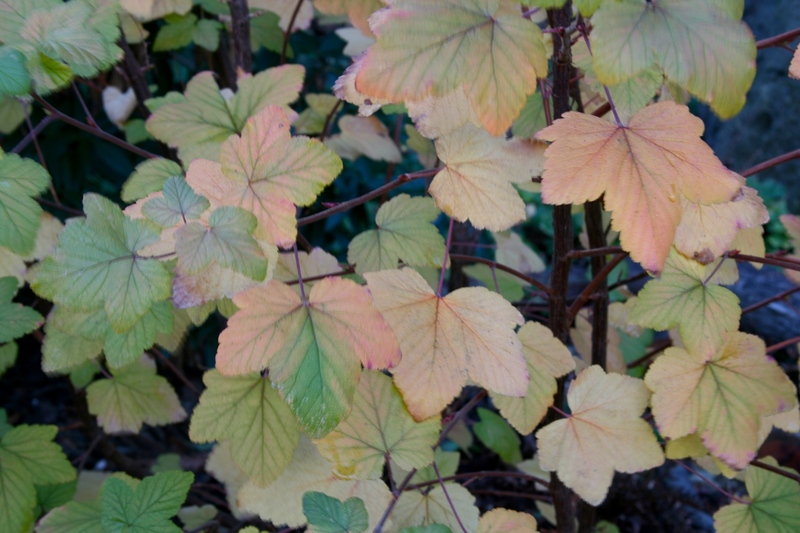 Everything still blooms, and all leaves are attached firmly to supple stems and branches. The aspens are vibrantly green, as are the high mountain grasses, thanks to heavy rain almost all summer. The ruby-throated hummingbirds still dip into pine-leaf penstemon, and all but disappear into foxglove blossoms. Then I stumbled on the bush in the photo at the top. It’s a currant, a berry-bearing bear attracter that confirmed my suspicions. It will be months before the snow flies. And as many months before bears hibernate and migrating Canadian geese honk south. I’ll be fly-fishing my way through late August and September, when the water is low, the days are cool, and the trout are lazy. The guide and I will eddy up and feast on meatloaf sandwiches and Fritos, and celebrate the end of another magnificent, beautiful, short summer in the Rockies. Even though the season has been appallingly brief this year, and I don’t think I’ve been warm more than twice, I’m ready for things to slow down. I welcome the gentleness of the season, tourists going home, predictable patterns of a community of neighbors driven by school schedules. I draped a sweater across the back of my office chair yesterday. I’m ready. But Harper Lee deserves better than what she’s getting, whether she’s aware or not. Sure, Go Set A Watchman is flying off the shelves. And her estate is growing by leaps and bounds. Her publicist, literary agent, and heirs must be delighted by this maelstrom. And she might be, too. 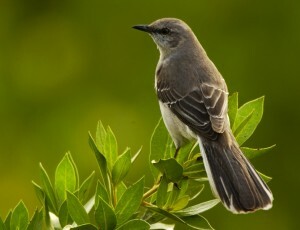 When To Kill a Mockingbird was released, it was controversial because of subject matter and social commentary. Literature is supposed to stir the soul, lighten the heart, provoke the mind. Lee’s epic work succeeds on all three counts. Go Set a Watchman is controversial for different reasons—reasons that strip the dignity from Lee by calling into question her mental stability, her cognizance, her ability for self-determination. The gravitas with which she withdrew from the literary world has been erased. And honestly, she’s out of time to set the record straight. Celebrity and fiscal gain, regardless of cost, might fit the world view of the Kardashians and probably won’t turn off their fans. But Lee’s work appeals to thinking people, and it’s hard to understand how this circus enhances her legacy. I worry for Lee and hope history remembers her well. To paraphrase Scout, a character I adore, I hope that someday, people will say that they’re sorry, and retire meditating about their crime. Because really, tarnishing the image of Lee is just that: criminal. Receiving a manuscript from my editor is a Christmas-morning event. The build-up takes weeks—months if you count writing. I joyfully anticipate the day. And have no idea what the file will contain in the way of criticisms or compliments. Book 3 (name omitted to protect my creativity) is safely home, barely scratched, and admirably refined. The next weeks will be full of fly fishing, hiking, concerts, farmers markets — and polishing my protagonist’s indomitable spirit in the face of war. Grace’s trademark humor made the editor laugh again, although she’s in a heap of trouble this time. 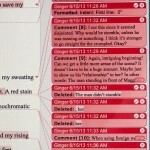 Her insights merited special comments — confirming that I’m expressing those emotions that unite us as humans — in the edit field. Her voice is stronger than ever. To put this in perspective, the first edit of When Camels Fly was adorned by a comment column that drooped off the right side of the screen. It was simply epic. And ugly. Overwhelmingly awful. I opened the file (proudly displayed to the left) and laughed because it was so bad. Could be I’m getting the hang of this writing thing. It’s such a privilege to write these novels, such a delight to be surrounded by so many talented professionals (agent, readers, editors, scientists). But the biggest joy is to hear from readers traveling this road with me. Women who say that they want to be Grace, or share her story with daughters and granddaughters. Men who call the work a first-rate work of suspense, or applaud my accurate use of weaponry — both cutting edge and archaic. So to celebrate the healthy return of book 3, here’s a snippet of a scene that occurs early in the story. It’s the first of several I’ll share in the coming weeks, and you’ll just never believe where archaeologist Grace Madison goes from here. 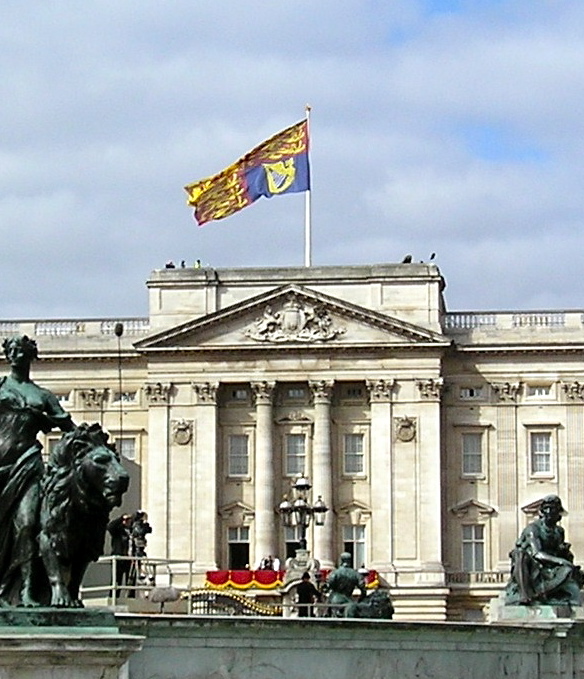 Beyond the hyacinth, a watery spring sun dropped halfway behind the Royal Standard flying above Buckingham Palace. 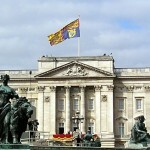 It tells the world that the Queen is at home. Billowing and snapping like a yellow scarf in the pale evening light, it did not lift my dark mood.